Financial Transparency - What Does It Mean? What does "financial transparency" mean? 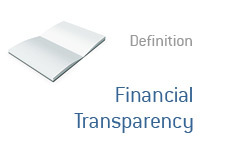 What is the definition of "financial transparency"? According to the Merriam-Webster dictionary, one of the definitions of "transparency" is "characterized by visibility or accessibility of information especially concerning business practices". If you asked the average person what "transparency" meant, they'd probably say something like "see through". "Financial transparency" means making information as accessible as possible. "Financial transparency", according to the SEC, means "timely, meaningful and reliable disclosures about a company's performance. "Financial transparency" means that you are not actively hiding anything. "Financial transparency" means being honest about your performance, even when it is subpar.